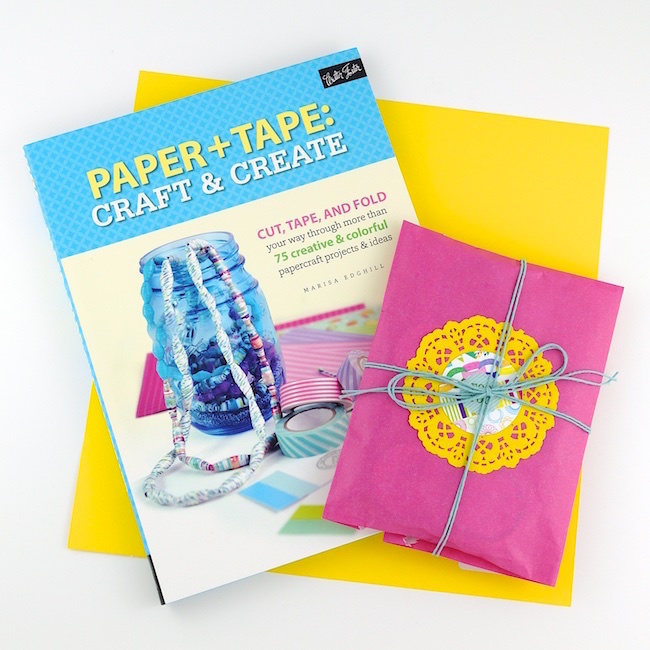 Now that I've introduced you to my new book "Paper + Tape: Craft & Create" and given you a peek at at some of the projects inside (perhaps you've even tried one or two), I thought it was the perfect time for a book giveaway! I'd love to share a copy of this project-packed craft book with one of you PLUS a fab grab bag filled with eight assorted rolls of washi tape. Just add some pretty paper and a pair of scissors and you'll be ready for crafty fun! "What's your favourite thing to create with paper and tape?" For an additional chance to win, tweet about the giveaway with the tag #paperplustapegiveaway. For additional chances, pop over to Instagram or Facebook and look for the above photo! Giveaway prize valued at $50. Giveaway open to Canada / US residents over the age of 18. Giveaway closes Sunday, May 15th, 2016 at 11:59pm. Winner will be randomly selected from all entries on Monday, May 16th, 2016. Winner will have one week after notification to claim their prize. If winner does not claim prize, a second winner will be randomly selected. I love making greeting cards too! My favourite thing to create with paper and tape is handmade books and junk journals. Thank you for offering a chance to win this great give away. Handmade books - so fun! I'd love to get into bookmaking. I mostly use my washing or greeting cards, but I should follow in the footsteps of my three boys who are so creative and have so much fun when I let them loose with my washi stash! Thanks for sharing this lovely prize, and congratulations on your book! What an amazing accomplishment! Thank you! Kids are so creative with tape (and everything else) - it's always so fun to see what they dream up! I also tweeted the giveaway! @Jennyroo1 Thanks for the extra chance!!! Custom gift wrap is the greatest! I love handmade cards - so thoughtful! I use washi tape as much as possible. Greeting cards (with matching envelopes), books, calendars. So much fun! Hurray for washi tape love! Paper & Tape = Happiest of Handmade Happy Mail! It really is! And who doesn't love Happy Mail?! Such a clever idea Jacki! I love fancy-ing up envelopes with washi tape! Fancy envelopes are the best! Handmade (or hand decorated) gift tags really are the perfect finishing touch! Beautiful monthly tags on my kids' communication planners from school. Makes it fun and easy to flip to the right spot! I love to make gift tags and greeting cards. This book looks like it has amazing ideas!!! Thanks!! We use them to make blades of a small wind turbine (for kids activities). It was awesome and all of the kids love the pretty tape! I make my own cards and love jazzing up the envelopes with washi tape. How exciting to have published a new book! Congratulations! I like layering washi on art journal pages and other mixed media projects. I love some of your fun ideas! Thanks so much Ann! Very exciting indeed! I love using my wash tape with paper for all kinds of things and cards and then incorporating them into my journal pages. Glad to see your back as I for one have been missing some of your great ideas! Thanks so much Maureen - so kind of you to say! I love using my washi tape on my day planner. It reminds me of the wonderful things I can look forward to. I can color my world! What a clever way to dress up you to-dos! Pretty mail is the best. Lucky pen pal! Love playing with paper and washi tape in pocket letters, decorate snail mail envelopes, mini albums, art journals and the list goes on. Congratulations on the new book!